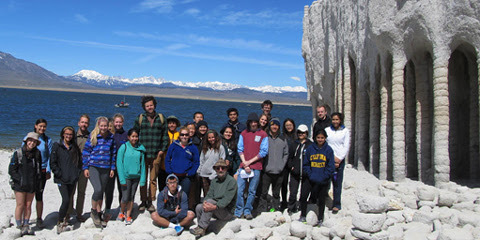 For 150 years, Berkeley’s Department of Earth & Planetary Science(EPS), has been training tomorrow’s scientific leaders. Today, that comprises everyone from geoscientists and engineers to GIS specialists to award winning science teachers. All of us together -- faculty, students, staff and alumni -- help make this department one of the world’s finest. We are “all in” on creating the best learning environment for our students. As you know, a student’s time at Cal is made up of many significant moments inside and outside the classroom. Do you remember the EPS field trip that was the turning point in your academic career? Or when you met the friends that were just as enthusiastic about volcanology as you were? Our students are part of so much more than just classroom curriculum -- from summer field camps to lab research and scholarly meetings, we immerse them in a scientific community. By doing that, we help them transition from science enthusiasts to identifying themselves as scientists. And many of those transformative moments wouldn’t be possible without the support of our incredible alumni and friends. Your gift can make a huge impact -- not only helping to create the next generation of leaders, but by enabling critical research that helps us understand today’s most unprecedented global challenges. On March 14th, use this link to make a gift to the Department of Earth & Planetary Science. Together, we’ll continue to advance one of the best hands-on, curiosity-driven learning environments for earth and planetary science students in the nation!